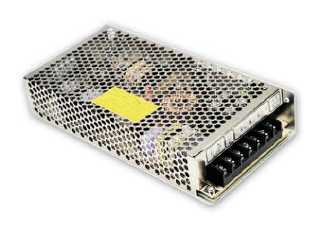 Below are a range of multiple (dual, triple and quad output) power supplies from Meanwell. Please see prices below and email us for trade & quantity pricing on Meanwell power supplies. In Australia, call 03-98306288 now to buy! Meanwell, also provide mains power adapters from 12W to 280W, Battery Chargers (including UPS), DC-DC Converters, DC-AC Inverters, LED Power Supplies and Medical Approved Power Supplies! Desktop power supplies - click here. The Meanwell S-150-24 is an old design that was used in many earlier applications. Drop-in replacements for the 12V, 24V and 48V units is the ADS-155. And Drop in replacements for the 13.5V and 27V is the AD-155. Note the output terminal connections are different! See below for drop-in replacements of D-60, D-120, T-60, T-120, Q-60, Q-120. EOL - End Of Line, the S-150 is NOT recommended for new designs! Click here to download MeanWell USER MANUAL in PDF (200KB). PRICE LIST.........prices current until 31st March, 2019 . . .
RD-35n, 35W dual v = 5V & 12V or 5V & 24V $40.00 $44.00 . RD-3513, 35W dual v = +13.5V & -13.5V (12-15V) $45.00 $49.50 . RD-50n, 50W dual v = 5V & 12V or 5V & 24V $45.00 $49.50 . RID-50n, 50W dual v = 5V & 12V or 24V independent $63.00 $69.30 . RD-65n, 65W dual v = 5V & 12V or 5V & 24V $54.00 $59.40 . RID-65n, 65W dual v = 5V & 12V or 24V independent $80.00 $88.00 . RID-85n, 85W dual v = 5V & 12V or 24V independent $90.00 $99.00 . RID-125-12v, 125W dual 12V & 5V or 24V independent $90.00 $99.00 . RT-50n, 50W triple +/-5V, +/-12V, +/-15V, 24V $50.00 $55.00 . RQ-50n, 50W quad +/-5V, +/-12V, +/-15V, 24V $54.00 $59.40 . RQ-65n, 65W quad +/-5V, +/-12V, +/-15V, 24V $60.00 $66.00 . TP-75n, 75W triple +/-5V, +/-12V, +/-15V, 24V $160.00 $176.00 . TP-7503, 75W triple 3.3V, +5V, +12V $170.00 $187.00 . TP-100n, 100W triple +/-5V, +/-12V, 24V $180.00 $198.00 . TP-150n, 150W triple +/-5V, +/-12V, +/-15V, 24V $200.00 $220.00 . QP-150n, 150W quad +/-5, +/-12, +/-15, 24V $200.00 $220.00 . QP-150-3n, 150W quad 3.3, +/-5, +/-12, +/-15, 24V $260.00 $286.00 . QP-200n, 200W quad +/-5, +/-12, +/-15, 24V $240.00 $264.00 . QP-200-3n, 200W quad 3.3, +/-5, +/-12, +/-15, 24V $270.00 $297.00 . QP-320n, 320W quad 5V, +/-12V, +/-15V, 24V $270.00 $297.00 . MP450, 450W 5slot 2,3.3,5,7.5,12,15,18,24,27,33,48V p.o.a. p.o.a. .
MP650, 650W 5slot 2,3.3,5,7.5,12,15,18,24,27,33,48V p.o.a. p.o.a. .
MP1K0, 1000W 7slot 2,3.3,5,7.5,12,15,18,24,27,33,48V p.o.a. p.o.a. .
For PCB multiple output power supplies (with medical application approval) - click here. Delivery charge within Australia $11 or $16.50 (express delivery). More for large orders to WA, NT, NF and remote QLD. Delivery to all overseas destinations - P.O.A. (ask us). EX-GST purchases may only be made when the delivery address is outside of Australia. i.e. for EXPORT orders. Prices subject to change without notice. Disclaimer: The above specifications are subject to change without notice. Please ensure the suitability of these products for your application before purchase. Exchange or refund does not apply to specials. No further discount applies with these products! Full warranty applies, although Procon Technology reserves the right to refund the purchase price or substitute equivalent products. Further note that the power supplies with open terminals are intended to be installed inside a "suitable" protective encloser with adequate ventilation provided. They must be installed by a qualified professional. Please contact us should you have any doubt.